In a sudden and overwhelming push, Harakat Nour al-Din al-Zinki and Free Syrian Army forces captured eight villages south of Afrin, pushing Hay’at Tahrir al-Sham out of the region entirely (except for the heavily-occupied Anadan plain). 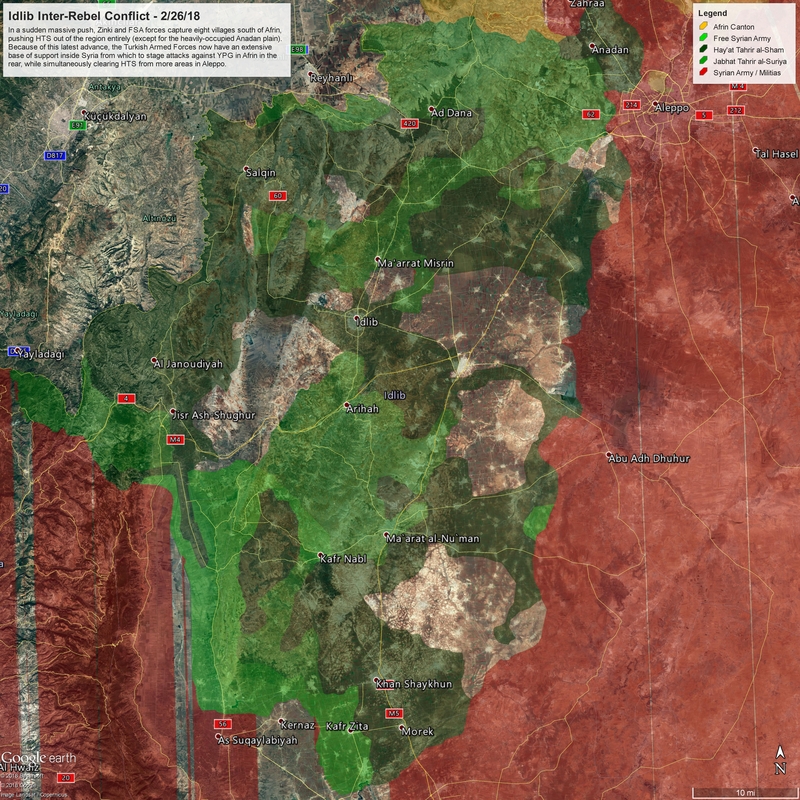 The captured villages include Atmeh, Qah, Salwa, Deir Simeon, Darat Izza, Kafr Tin, Busratun, and Tuqad. The unexpectedness and sheer size of this advance, along with the sudden capture of the major town Darat Izza, indicates that Turkey was involved, likely by providing military direction and logistical support. Turkey has good reason to back this move. Because of this latest advance, the Turkish Armed Forces can now lay claim to an extensive base of support inside Syria west of Aleppo. No longer while Turkey be forced to smuggle weapons to rebel groups far away through narrow corridors in order to expand its influence and defeat HTS. From this pocket, Turkey can now coordinate and stage attacks against YPG in Afrin in the rear, while simultaneously clearing HTS from more areas in Aleppo.